There are a number of factors that play a significant role in determining CNA salary. Geographic location, education level, experience – are a few of them. As per the Bureau of Labor Statistics (BLS), the mean annual and hourly CNA salary in Illinois was $25,340 and $12.18, as of May 2013. Total number of CNAs employed was 61,200, and the employment per 1000 for these professionals was, 10.73. According to the statistics provided by indeed.com, the average income of nursing assistants was $28,000 (as of December, 2014). Fortunately, this average pay was 13% higher than the national average salary. 90% of CNAs were salaried less than $34,280; 10% were salaried more than $34,280. 75% of certified nurse assistants earned less than $28,690; the remaining 25% earned more than $28,690. 50% of the employees were offered annual wages less than $23,840; the rest of 50% were offered more than $23,840. 25% made less than $20,860; 75% made more than $20,860. 10% of CNAs were paid less than $18,960; 90% were offered more than $18,960. We can conclude from the following table that maximum cities in the state of Illinois provide median annual salary of $32,282 and median monthly salary$2,690. 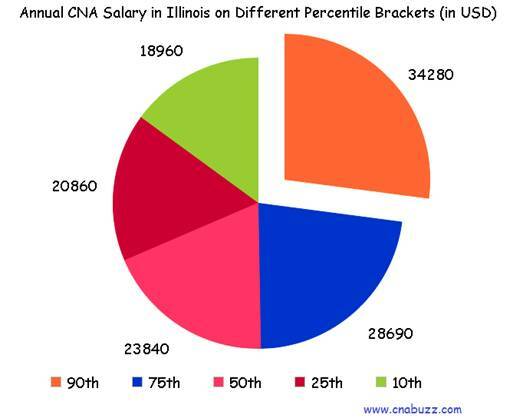 CNAs employed in Champaign were paid the lowest salary of $26,861. The median weekly income ranged from $517 to $621, and the median hourly salary ranged from $13 to $16. 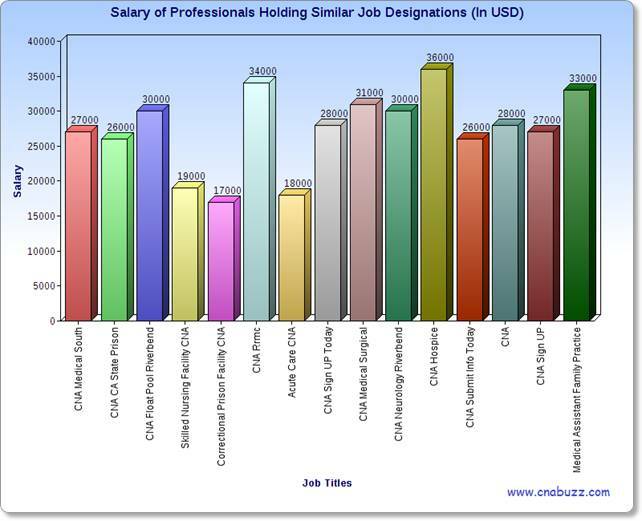 CNA Hospice was the highest paid professional with the salary of $36,000. CNA Rrmc followed them with pay of $34,000. Medical Assistant Family Practice made $33,000. Others enjoyed income between $17,000 and $31,000. The data given in the below table reveals the detail of income (as of December 2014) earned by professionals with various job titles. The best part of being in the nursing sector is that the requirement of nurses never ends, whether it is inflation or deflation. The need for CNAs always remains high; thus, nursing is a recession-proof profession. All clinics and hospitals require nurse aides to help their patients. In general, if we look at the employment opportunities of these workers, we can conclude that the future of medical professionals is bright in the U.S. Question 1 – I have just completed my certification. I wanted to know the top paying nursing assistant jobs in Illinois. Can anyone help me? Answer – As per the data provided by indeed.com, in December 5, 2014, the topmost paying job title in IL was CNA Hospice, with an average salary of $36,000. Other top paying job titles include – Medical Assistant Family Practice, CNA Neurology Riverbend, CNA Rrmc, CNA Float Pool Riverbend, and CNA Medical Surgical. Question 2 – At present, I am a part of Connecticut nurse aide registry, but I’m planning to move to the state of Illinois. Can I know the salary package of nurse aide in this state? Answer – Generally, CNAs earn an average annual pay of $28,000(according to the data provided by the indeed.com).